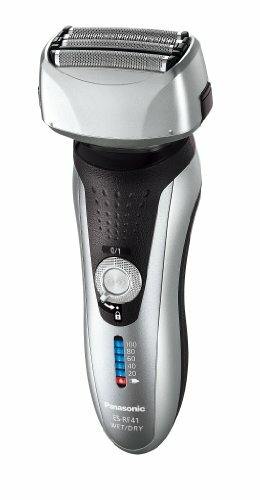 The Panasonic ES-RF 41 Rechargeable Four-Blade Electric Shaver for Men (Wet/Dry) is one of the best choices for you if you love the combination of technology and high precision. Like all other premium shavers from Panasonic, the ES-RF41 is packed with sophisticated yet easy to understand technological features that are designed to give you smooth shaves every time you use the shaver. It is one of the few shavers in the world that operates on super sharp four blade technology, thereby enabling you to get a close yet skin-friendly shave all the time. With its durable and sleek design, the Panasonic ES-RF41 is a hit among men. Comes with arc-shaped, honeycomb foils to move against your skin in a gentle manner; the foil is as fragile as 41 microns and thus enables easy removal of hairs from difficult to access areas like neck, chin, throat. The arc-shape helps to move across the different levels of your face so you get a better shave then an electric shaver with a flat head. The head of the shaver also pivots 8mm from side to side to follow the contours of your face. The Panasonic ES-RF41 claims that it contains the goodness of four-blade technology. However, in reality, we must admit that the technology is not as efficient as we expected it to be. Some users have reported pulling and tugging issues during their daily shaves. Overall, it has 4.3 out of 5 stars with around 805 four stars or higher, and about 10% with below 2 stars. It comes in properly at the mid-level price point for an electric razor for its performance. 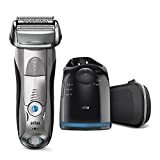 If you are looking for a better electric shaver in the mid-level price point we would recommend the Braun series 7 7898cc Electric Shaver.